A spiritual daughter of St Paul of the Cross, Gemma Galgani’s life carries a great message for all Passionists. To be called to be a Passionist is a calling “to suffer many things,” like Jesus himself who came not to be served but to serve and to offer his life for his brothers and sisters. The next major event in Gemma’s life happened when she was only 19 years old with the passing of her father. Gemma was left orphaned and without any means of support. Soon after this event, Gemma experienced a long and serious illness. As her conditioned worsened, she developed spinal curvature and even paralysis. It was believed that no medical remedy could cure her. With hopes of a miracle, one of the Sisters gave Gemma a novena card along with the story of the life of the young Passionist, Gabriel Possenti. On her deathbed, Gemma fervently prayed to him. During the prayers of the Novena, Gabriel appeared to Gemma. In promising her that she would wear the same habit he did, Gabriel told her that she would be blessed with a cure and that a special grace was being prepared for her. During the remainder of Gemma’s life, many witnessed this recurring miracle of the holy stigmata. Soon after this extraordinary blessing, Gemma made the Holy Year mission at the Cathedral of St Martin where she first met the Passionist missionary, Father Cajetan. He listened to her miraculous story and allowed her to take private vows. Through Father Cajetan she was introduced to Father Germano Ruoppolo. At the time, Father Germano was the postulator general working on the cause for the beatification of St Gabriel. An eminent theologian and well acquainted with mystical prayer, Father Germano recognized Gemma’s profound, prayerful life. In their prayerful conversations, Gabriel continued to promise Gemma that she would become a Passionist Nun. It is believed that due to health problems, Gemma would, in fact, remain a layperson and was never to become a nun. For this sacrifice, the Lord told Gemma that a convent would come to Lucca through the work of her spiritual father, Father Germano. Our Lord called Gemma home on Holy Saturday, 11 April 1903. One of the Sisters present clothed Gemma’s body in the habit of the Passionists, the order to which she had aspired. On 3 October 1905, Father Germano obtained a letter of authorization from Pope Pius X for the foundation of the convent in Lucca. In 1906 Euphemia Gianini entered, taking the name Gemma Magdalena. How proud Gemma would have been! The convent grew and flourished. 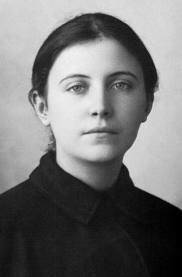 Pope Pius XII canonized Gemma Galgani in 1940. Her body is buried in the chapel of the new convent at Lucca.